America's Answer to a Leaking Metal Roof! 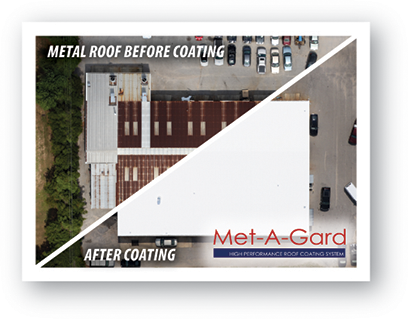 We do much more than just provide superior coatings for metal roofs. We can restore and protect all types of commercial flat roofs including modified bitumen, built-up smooth, built-up gravel, EPDM, single-ply, spray foam, and concrete. Learn more about sealing, protecting, and preventing leaks to your commercial, low-slope flat roof here. AWS metal roof coatings are seamless, bright white, and reflective. This means, in addition to limiting the areas where a leak can occur - seams are one of the most common places where a roof leak begins - the bright white reflectivity of the roof coating makes the sun's harmful UV rays bounce off the top coat before harming the roof. This also reduces thermo-cycling, the destructive process where the sun's heat wears down the roof prematurely due expansion and contraction. AWS uses elastomeric roof coatings that will seal and protect almost any roof substrate including modified bitumen roofs, smooth builtup roof, gravel built up roof, spray foam, concrete flat roofs, metal roofing, EPDM, single-ply, wood, steel, and most traditional roofing systems. Our roof coatings are rubber roof membranes that are liquid applied and require minimal roof top equipment. This provides the building owner with a business as usual condition during the roof coating application process. After the roof coating application is complete, we can offer a long term, roof coating manufacturer's material and/or system warranty to keep your mind at ease for years to come. AWS is backed by a nationwide network of approved contractors who are expert commercial roofers, well versed in the application of AWS roofing systems, and are ready, willing, and able to come to you and assess your roof's condition for free. We have roofing systems that are UL, FM, and Miami-Dade County approved. Energy Star products and systems are also AWS standards. To get started with your free roof assessment, visit your nearest city's website below or contact us now to find the AWS Approved Contractor nearest to you.